Implantable medical devices having anti-restenotic coatings are disclosed. Specifically, implantable medical devices having coatings of certain antiproliferative agents, particularly certain protein farnesyl transferase inhibitors, are disclosed. The anti-restenotic protein farnesyl transferase inhibitors are tipifarnib, lonafarnib, and pharmaceutically acceptable derivatives thereof. The anti-restenotic medial devices include stents, catheters, micro-particles, probes and vascular grafts. Intravascular stents are preferred medical devices. The medical devices can be coated using any method known in the art including compounding the protein farnesyl transferase inhibitor with a biocompatible polymer prior to applying the coating. Moreover, medical devices composed entirely of biocompatible polymer-protein farnesyl transferase inhibitor blends are disclosed. Additionally, medical devices having a coating comprising at least one protein farnesyl transferase inhibitor in combination with at least one additional therapeutic agent are also disclosed. Furthermore, related methods of using and making the anti-restenotic implantable devices are also disclosed. This application is a continuation-in-part of provisional application No. 60/531,291, filed Dec. 18, 2003. The present invention relates to medical devices and methods of using medical devices to treat or inhibit restenosis. Specifically, the present invention relates to stents that provide in situ controlled release delivery of anti-restenotic compounds. More specifically, the present invention provides intravascular stents that provide anti-restenotic effective amounts of certain antiproliferative agents, particularly certain protein farnesyl transferase inhibitors, directly to tissues at risk for restenosis. Cardiovascular disease, specifically atherosclerosis, remains a leading cause of death in developed countries. Atherosclerosis is a multifactorial disease that results in a narrowing, or stenosis, of a vessel lumen. Briefly, pathologic inflammatory responses resulting from vascular endothelium injury causes monocytes and vascular smooth muscle cells (VSMCs) to migrate from the sub endothelium and into the arterial wall's intimal layer. There the VSMC proliferate and lay down an extracellular matrix causing vascular wall thickening and reduced vessel patency. Cardiovascular disease caused by stenotic coronary arteries is commonly treated using either coronary artery by-pass graft (CABG) surgery or angioplasty. Angioplasty is a percutaneous procedure wherein a balloon catheter is inserted into the coronary artery and advanced until the vascular stenosis is reached. The balloon is then inflated restoring arterial patency. One angioplasty variation includes arterial stent deployment. Briefly, after arterial patency has been restored, the balloon is deflated and a vascular stent is inserted into the vessel lumen at the stenosis site. After expansion of the stent, the catheter is then removed from the coronary artery and the deployed stent remains implanted to prevent the newly opened artery from constricting spontaneously. An alternative procedure involves stent deployment without prior balloon angioplasty, the expansion of the stent against the arterial wall being sufficient to open the artery, restoring arterial patency. However, balloon catheterization and/or stent deployment can result in vascular injury ultimately leading to VSMC proliferation and neointimal formation within the previously opened artery. This biological process whereby a previously opened artery becomes re-occluded is referred to as restenosis. Treating restenosis requires additional, generally more invasive, procedures including CABG in severe cases. Consequently, methods for preventing restenosis, or treating incipient forms, are being aggressively pursued. One possible method for preventing restenosis is the administration of anti-inflammatory compounds that block local invasion/activation of monocytes thus preventing the secretion of growth factors that may trigger VSMC proliferation and migration. Other potentially anti-restenotic compounds include antiproliferative agents such as chemotherapeutics including rapamycin and paclitaxel. Rapamycin is generally considered an immunosuppressant best known as an organ transplant rejection inhibitor. However, rapamycin is also used to treat severe yeast infections and certain forms of cancer. Paclitaxel, known by its trade name Taxol®, is used to treat a variety of cancers, most notably breast cancer. However, anti-inflammatory and antiproliferative compounds can be toxic when administered systemically in anti-restenotic-effective amounts. Furthermore, the exact cellular functions that must be inhibited and the duration of inhibition needed to achieve prolonged vascular patency (greater than six months) are not presently known. Moreover, it is believed that each drug may require its own treatment duration and delivery rate. Therefore, in situ, or site-specific drug delivery using anti-restenotic coated stents has become the focus of intense clinical investigation. Recent human clinical studies on stent-based anti-restenotic delivery have centered on rapamycin and paclitaxel. In both cases excellent short-term anti-restenotic effectiveness has been demonstrated. However, side effects including vascular erosion have also been seen. Vascular erosion can lead to stent instability and further vascular injury. Furthermore, the extent of cellular inhibition may be so extensive that normal re-endothelialization will not occur. The endothelial lining is essential for maintaining vascular elasticity and as an endogenous source of nitric oxide. Therefore, there is a need for compounds that exert localized anti-restenotic effects while minimizing vascular and cellular damage in order to ensure the long-term success of drug delivery stents. The present invention provides an in situ drug delivery platform that can be used to administer anti-restenotic tissue levels of certain antiproliferative agents, particularly certain protein farnesyl transferase inhibitors, without systemic side effects. It has been found that the protein farnesyl transferase inhibitors tipifarnib, lonafarnib, and the pharmaceutically acceptable derivatives thereof, are particularly effective for this purpose. In one embodiment of the present invention the drug delivery platform is an implantable medical device including, without limitation, intravascular stents, catheters, perivascular drug injection catheters or transvascular micro syringes for adventitial drug delivery, and vascular grafts. In another embodiment of the present invention, an intravascular stent is directly coated with a protein farnesyl transferase inhibitor compound selected from the group consisting of tipifarnib, lonafarnib and pharmaceutically acceptable derivatives thereof. The tipifarnib or lonafarnib can be attached to the vascular stent's surface using any means that provide a drug-releasing platform. Coating methods include, but are not limited to precipitation, coacervation, and crystallization. The tipifarnib or lonafarnib of the present invention can be bound covalently, ionically, or through other molecular interactions including, without limitation, hydrogen bonding and van der Waals forces. In another embodiment of the present invention the tipifarnib or lonafarnib is complexed with a suitable biocompatible polymer. The polymer-drug complex is then used to either form a controlled-release medical device, integrated into a preformed medical device or used to coat a medical device. The biocompatible polymer may be any non-thrombogenic material that does not cause a clinically relevant adverse response. Other methods of achieving controlled drug release are contemplated as being part of the present invention. Moreover, the tipifarnib or lonafarnib of the present invention can be combined with other anti-restenotic compounds including cytotoxic, cytostatic, anti-metabolic and anti-inflammatory compounds. In yet another embodiment of the present invention an anti-restenotic compound-coated intravascular stent can be combined with the systemic delivery of the same or another anti-restenotic compound to achieve a synergistic or additive effect at the medical device placement site. This is particularly beneficial in that non-toxic therapeutic levels of tipifarnib or lonafarnib and other anti-restenotic therapeutics can be combined to achieve dose-specific synergism. In one embodiment of the present invention the tipifarnib or lonafarnib is directly coated onto the surface of a metal stent. In another embodiment of the present invention the stent is coated with a bioerodable polymer having the tipifarnib or lonafarnib dispersed therein. In another embodiment of the present invention the stent is coated with a non-bioerodable polymer having the tipifarnib or lonafarnib dispersed therein. In yet another embodiment of the present invention a stent is coated with a first polymer layer having the tipifarnib or lonafarnib dispersed therein and a second layer of polymer provided over the first polymer layer. In yet another embodiment of the present invention a stent is provided with a tipifarnib or lonafarnib coating and at least one other antiplatelet, antimigratory, antifibrotic, antiproliferative and/or anti-inflammatory agent combined therewith. In yet another embodiment of the present invention the stent is selected from the group consisting of intravascular stents, biliary stents, esophageal stents, and urethral stents. In yet another embodiment of the present invention the stent is a metallic stent. In still another embodiment of the present invention the stent is a polymer stent. In another embodiment of the present invention there is provided a method for treating or inhibiting restenosis by providing an intravascular stent having a coating comprising a protein farnesyl transferase inhibitor and implanting the stent in a blood vessel lumen at risk for restenosis wherein the protein farnesyl transferase inhibitor is released into tissue adjacent the blood vessel lumen. In yet another embodiment of the present invention there is provided a method for producing a medical device by providing a medical device to be coated, compounding a protein farnesyl transferase inhibitor with a carrier compound, and coating the medical device with the protein farnesyl transferase inhibitor compounded with the carrier compound. Additional embodiments of the present invention will be apparent to those skilled in the art from the drawings and detailed disclosure that follows. FIG. 1 depicts an intravascular stent used to deliver the antirestenotic compounds of the present invention. FIG. 2 depicts a balloon catheter assembly used for angioplasty and the site-specific delivery of stents to anatomical lumens at risk for restenosis. The present invention relates to restoring patency to anatomical lumens that have been occluded, or stenosed, as a result of mechanical trauma, surgical injury, pathologies or normal biological processes including genetic anomalies. The present invention can be used to restore and maintain patency in any anatomical lumen, including, but not limited to blood vessels, ducts such as the biliary duct, and wider lumens including the esophagus and urethra. Furthermore, graft site associated stenoses can also be treated using the teachings of the present invention. In one embodiment of the present invention the stenosed lumen is an artery, specifically a coronary artery. Stenosed coronary arteries generally result from plaque that develops on the interior lining of a coronary artery. Present models attribute this pathology to vascular injuries that are associated with life style and diet. Two major categories of vascular plaque are thought to contribute to over 90% of coronary artery disease (CAD): vulnerable plaque and stable plaque. While both plaque types can contribute to stenosis requiring intervention consistent with the teachings of the present invention, vulnerable plaque is more frequently associated with sudden coronary death resulting from plaque rupture and the associated thrombogenic processes, rather than with stenosis. Stable plaque is not prone to rupture due to the presence of a thick fibrous cap and less amorphous, more stable, smaller lipid core than found in vulnerable plaque, and is more amenable to angioplasty and stent deployment. Therefore, the majority of vascular stenoses requiring intervention are associated with stable plaque. In one embodiment of the present invention percutaneous transluminal coronary angioplasty (PTCA), or balloon angioplasty, is used to correct stenoses found in coronary, iliac or kidney arteries, followed by stent deployment. Stents are mesh-like structures or coils that are mounted to an angioplasty balloon for expansion, or are self-expanding, and are permanently placed in the artery or vein following PTCA. In the typical procedure a patient is brought to the cardiac catheterization lab where intravenous fluids and medications are administered prior to beginning PTCA. Patients may also receive intravenous sedation to provide some comfort and anxiety relief. Next arterial and venous punctures are made and a sheath is inserted to provide access to the vascular system for a guidewire and coronary catheter. The coronary catheter is advanced over the guidewire and gently brought near the orifice of the coronary arteries. The guidewire is then removed and intravenous x-ray contrast dye is injected into the coronary arteries to facilitate visualizing the exact location of the stricture and the degree of narrowing. The patient's blood pressure, heart rate, electrocardiogram, and oxygen saturation are monitored continuously. If severe stenosis of the coronary arteries is identified, an angioplasty balloon is inflated to dilate the stenosed region and a vascular stent is deployed to prevent immediate tissue elastic recoil and arterial re-occlusion. Exact stent placement is confirmed using repeat x-rays and when appropriate, intra-coronary ultrasound. One of the major complications associated with vascular stenting is restenosis. Restenosis results from injury to the vascular endothelium associated PTCA and stenting procedures. Briefly, the process of inflating the balloon catherter can tear the vessels' initmal layer of endothelial cells. The damaged endothelial cells secrete growth factors and other mitogenic agents causing monocytes and vascular smooth muscle cells (VSMCs) to migrate from the sub endothelium and into the arterial wall's intimal layer. Other embodiments of the present invention include stenting procedures for peripheral vascular disease, such as, but not limited to, iliac artery stenosis, renal hypertension due to severe renal artery stenosis, and carotid artery stenosis. Moreover, neurovascular applications of the present invention are also considered within the scope of the present invention. It has been found that certain compounds are particularly effective in the prevention or inhibition of restenosis. In the detailed description and claims that follow, these compounds used to prevent restenosis may be referred to herein or elsewhere as antiproliferative agents, protein farnesyl transferase inhibitors, tipifarnib or lonafarnib. Tipifarnib is also known as R-115777 or Zarnestra®, a trademark of Johnson & Johnson. 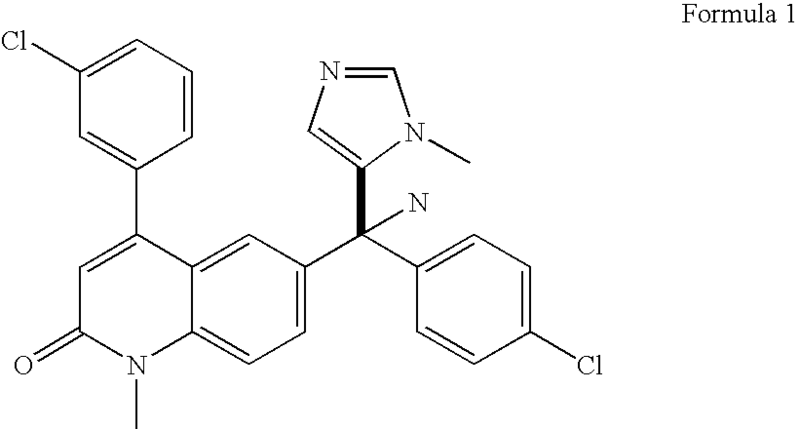 Tipifarnib has the chemical name 6-[amino(4-chlorophenyl)(1-methyl-1H-imidazol-5-yl)methyl]-4-(3-chlorophenyl)-1-methyl-2(1H)-quinolinone and is presently being developed for various cancer indications by Janssen Pharmaceutica NV and its parent company Johnson & Johnson. It has the chemical structure as depicted in Formula 1. 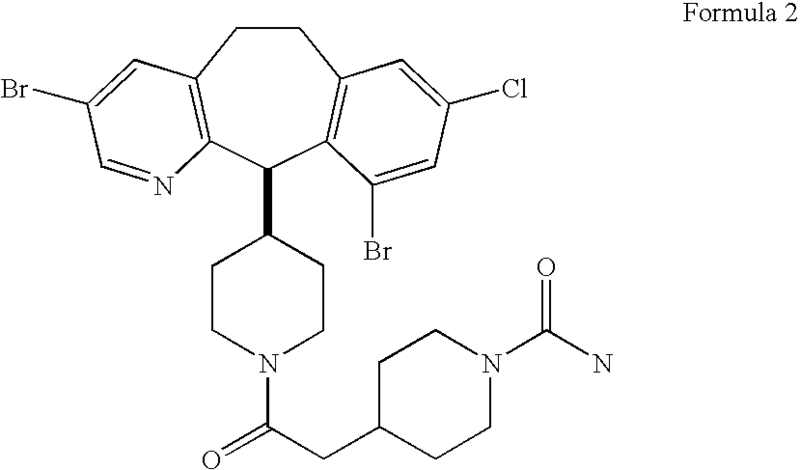 Lonafarnib is also known as Sch-66336 and has the chemical name (+)-4-[2-[4-(8-chloro-3,10-dibromo-6,11-dihydro-5H-benzo[5,6]cyclohepta[1,2-b]-pyridin-11 (R)-yl)-1-piperidinyl]-2-oxo-ethyl-11-piperidinecarboxamide. It is presently being developed for various cancer indications by the Schering Plough Research Institute. It has the chemical structure as depicted in Formula 2. All of these terms may be used interchangeably without distinction and are all considered to within the scope of the present invention. Neo-intima formation resulting from VSMC proliferation at the site of vascular injury accounts for the majority of non-elastic recoil restenosis. Physical stress applied to the stenosed artery's intimal lining during angioplasty often results in rupture of the endothelial layer and damage to the underlying VSMC layer. The associated cell injury triggers a cascade of events that cause the VSMCs to de-differentiate and proliferate through the damaged intima re-occluding the artery. The compounds of the present invention are believed to act as protein farnesyl transferase inhibitors. Protein farnesyl transferase inhibitors inhibit Ras protein function. Ras activates several downstream effectors such as Raf-1, Rac, Rho and phosphatidylinositol-3-kinase, which mediate important cellular functions such as proliferation and cytoskeletal organization. Without being bound by any particular mechanism of action, it is believed that the above mechanistic description portrays how the compounds of the present invention function as anti-restenotic agents. The present invention includes novel compositions and methods for delivering protein farnesyl transferase inhibitors directly to tissues susceptible to restenosis. Specifically, the present invention is directed at implantable medical devices, preferably intravascular stents, which provide for the in situ, site-specific, controlled release of ligands that bind to and prevent activation of certain receptors, thereby inhibiting vascular smooth muscle cell (VSMC) proliferation. In one embodiment of the present invention medical devices are provided with a protein farnesyl transferase inhibitor such as tipifarnib or lonafarnib. It will be understood by those skilled in the art that many salts, analogs and other derivatives are also possible that do not affect the efficacy or mechanism of action of the protein farnesyl transferase inhibitors of the present invention. Therefore, the present invention is intended to encompass tipifarnib, lonafarnib and pharmaceutically acceptable derivatives thereof, particularly pharmaceutically acceptable acid addition salts thereof. The term “pharmaceutically acceptable derivatives” as used herein includes all derivatives, analogs, enantiomers, diastereomers, stereoisomers, free bases, and acid addition salts, as the case may be, that are not substantially toxic at anti-restenotic-effective levels in vivo. “Not substantially toxic” as used herein shall mean systemic or localized toxicity wherein the benefit to the recipient out-weighs the physiologically harmful effects of the treatment as determined by physicians and pharmacologists having ordinary skill in the art of chemotherapy and toxicology. Pharmaceutically acceptable salts include, without limitation, salts formed with inorganic or organic acids commonly used for pharmaceutical purposes. The protein farnesyl transferase inhibitors of the present invention may be delivered, alone or in combination with synergistic and/or additive therapeutic agents, directly to the affected area using medical devices. Potentially synergistic and/or additive therapeutic agents may include drugs that impact a different aspect of the restenosis process such as antiplatelet, antimigratory or antifibrotic agents. Alternately they may include drugs that also act as antiproliferatives and/or anti-inflammatories. For example, and not intended as a limitation, synergistic combination, considered to within the scope of the present invention include at least one protein farnesyl transferase inhibitor and an antisense anti-c-myc oligonucleotide, least one protein farnesyl transferase inhibitor and rapamycin or analogues and derivatives thereof such a 40-0-(2-hydroxyethyl)-rapamycin, at least one protein farnesyl transferase inhibitor and exochelin, at least one protein farnesyl transferase inhibitor and an N-acetyl cysteine inhibitor, at least one protein farnesyl transferase inhibitor and a PPARγ agonist, and so on. The medical devices used in accordance with the teachings of the present invention may be permanent medical implants, temporary implants, or removable implantable devices. For example, and not intended as a limitation, the medical devices of the present invention may include, intravascular stents, catheters, perivascular drug injection catheters or transvascular micro syringes, and vascular grafts. In one embodiment of the present invention stents are used as the drug delivery platform. The stents may be intravascular stents, urethral stents, biliary stents, or stents intended for use in other ducts and organ lumens. Vascular stents may be used in peripheral, neurological or coronary applications. The stents may be rigid expandable stents or pliable self-expanding stents. Any biocompatible material may be used to fabricate the stents of the present invention including, without limitation, metals or polymers. The stents of the present invention may also be bioresorbable. In one embodiment of the present invention intravascular stents are implanted into coronary arteries immediately following angioplasty. However, one significant problem associated with stent implantation, specifically intravascular stent deployment, is restenosis. Restenosis is a process whereby a previously opened lumen is re-occluded by VSMC proliferation. Therefore, it is an object of the present invention to provide stents that suppress or eliminate VSMC migration and proliferation and thereby reduce, and/or prevent restenosis. In one embodiment of the present invention metallic intravascular stents are coated with one or more anti-restenotic compounds, specifically at least one protein farnesyl transferase inhibitor. More specifically the protein farnesyl transferase inhibitor is tipifarnib or lonafarnib. The protein farnesyl transferase inhibitor may be dissolved or suspended in any carrier compound that provides a stable composition that does not react adversely with the device to be coated or inactivate the protein farnesyl transferase inhibitor. The metallic stent is provided with a biologically active protein farnesyl transferase inhibitor coating using any technique known to those skilled in the art of medical device manufacturing. Suitable non-limiting examples include impregnating, spraying, brushing, dipping, rolling and electrostatic deposition. After the protein farnesyl transferase inhibitor solution is applied to the stent it is dried leaving behind a stable protein farnesyl transferase inhibitor-delivering medical device. Drying techniques include, but are not limited to, heated forced air, cooled forced air, vacuum drying or static evaporation. The anti-restenotic effective amounts of protein farnesyl transferase inhibitors used in accordance with the teachings of the present invention can be determined by a titration process. Titration is accomplished by preparing a series of stent sets. Each stent set will be coated, or contain different dosages of the protein farnesyl transferase inhibitor agonist selected. The highest concentration used will be partially based on the known toxicology of the compound. The maximum amount of drug delivered by the stents made in accordance with the teaching of the present invention will fall below known toxic levels. Each stent set will be tested in vivo using the preferred animal model as described in Example 5 below. The dosage selected for further studies will be the minimum dose required to achieve the desired clinical outcome. In the case of the present invention, the desired clinical outcome is defined as the inhibition of vascular re-occlusion, or restenosis. Generally, and not intended as a limitation, an anti-restenotic effective amount of the protein farnesyl transferase inhibitors of the present invention will range between about 0.5 ng and 1.0 mg, most preferably between about 10 μg and 1.0 mg, depending on the particular protein farnesyl transferase inhibitor used and the delivery platform selected. In addition to the protein farnesyl transferase inhibitor selected, treatment efficacy may also be affected by factors including dosage, route of delivery and the extent of the disease process (treatment area). An effective amount of a protein farnesyl transferase inhibitor composition can be ascertained using methods known to those having ordinary skill in the art of medicinal chemistry and pharmacology. First the toxicological profile for a given protein farnesyl transferase inhibitor composition is established using standard laboratory methods. For example, the candidate protein farnesyl transferase inhibitor composition is tested at various concentrations in vitro using cell culture systems in order to determine cytotoxicity. Once a non-toxic, or minimally toxic, concentration range is established, the protein farnesyl transferase inhibitor composition is tested throughout that range in vivo using a suitable animal model. After establishing the in vitro and in vivo toxicological profile for the protein farnesyl transferase inhibitor compound, it is tested in vitro to ascertain if the compound retains antiproliferative activity at the non-toxic, or minimally toxic ranges established. Finally, the candidate protein farnesyl transferase inhibitor composition is administered to treatment areas in humans in accordance with either approved Food and Drug Administration (FDA) clinical trial protocols, or protocol approved by Institutional Review Boards (IRB) having authority to recommend and approve human clinical trials for minimally invasive procedures. Treatment areas are selected using angiographic techniques or other suitable methods known to those having ordinary skill in the art of intervention cardiology. The candidate protein farnesyl transferase inhibitor composition is then applied to the selected treatment areas using a range of doses. Preferably, the optimum dosages will be the highest non-toxic, or minimally toxic concentration established for the protein farnesyl transferase inhibitor composition being tested. Clinical follow-up will be conducted as required to monitor treatment efficacy and in vivo toxicity. Such intervals will be determined based on the clinical experience of the skilled practitioner and/or those established in the clinical trial protocols in collaboration with the investigator and the FDA or IRB supervising the study. The protein farnesyl transferase inhibitor therapy of the present invention can be administered directly to the treatment area using any number of techniques and/or medical devices. In one embodiment of the present invention the protein farnesyl transferase inhibitor composition is applied to an intravascular stent. The intravascular stent can be of any composition or design. For example, the stent may be a self-expanding stent 10 depicted in FIG. 1, or a balloon-expandable stent 10 depicted in FIG. 1, expanded using a balloon catheter depicted in FIG. 2. The medical device can be made of virtually any biocompatible material having physical properties suitable for the design. For example, tantalum, stainless steel, nickel alloys, chromium alloys, titanium alloys and cobalt alloys have been proven suitable for many medical devices and could be used in the present invention. A cobalt alloy such as that used in the Driver® coronary stent of Medtronic Vascular, Inc. is particularly useful for this purpose. Also, medical devices made with biostable or bioabsorbable polymers can be used in accordance with the teachings of the present invention. In yet other embodiments the protein farnesyl transferase inhibitor therapy of the present invention is delivered using a porous or “weeping” catheter to deliver a protein farnesyl transferase inhibitor-containing hydrogel composition to the treatment area. Still other embodiments include microparticles or other forms delivered using a catheter such as a perivascular drug injection catheter or transvascular micro syringe for adventitial delivery, or other intravascular or transmyocardial device. In one embodiment of the present invention an injection catheter as depicted in United States patent application publication No. 2002/0198512 A1, United Sates patent application Ser. No. 09/961,079 and U.S. Pat. No. 6,547,803 (all of which are herein incorporated by reference in their entirety, specifically those sections directed to adventitial delivery of pharmaceutical compositions) can be used to administer the AR inhibitor compounds of the present invention directly to the adventitia. While it is presently preferred to coat a medical device such as a vascular stent with a compound of the invention contained in a polymer matrix, the device may be directly coated with a compound of the invention without a polymer matrix. The compound can be attached to the vascular stent using any means that provide a drug-releasing platform. Coating methods include, but are not limited to precipitation, coacervation, vapor deposition, ion beam implantation, and crystallization. The compound of the present invention can be bound covalently, ionically, or through other molecular interactions including, without limitation, hydrogen bonding and van der Waals forces. The “coating” may be of the entire surface, a portion of the surface, channels or wells in the surface, impregnation below the surface of the stent, or by other means as described in the art. Although the medical device surface should be clean and free from contaminants that may be introduced during manufacturing, the medical device surface requires no particular surface treatment in order to retain the coating applied in the present invention. With reference to FIG. 1, both surfaces (inner 14 and outer 12 of stent 10, or top and bottom depending on the medical device's configuration) of the medical device may be provided with the coating according to the present invention. In order to provide the coated medical device according to the present invention, a solution that includes a solvent, a polymer dissolved in the solvent and a protein farnesyl transferase inhibitor composition dispersed in the solvent is first prepared. It is important to choose a solvent, a polymer and a therapeutic substance that are mutually compatible. It is essential that the solvent is capable of placing the polymer into solution at the concentration desired in the solution. It is also essential that the solvent and polymer chosen do not chemically alter the protein farnesyl transferase inhibitor's therapeutic character. However, the protein farnesyl transferase inhibitor composition only needs to be dispersed throughout the solvent so that it may be either in a true solution with the solvent or dispersed in fine particles in the solvent. The solution is applied to the medical device and the solvent is allowed to evaporate leaving a coating on the medical device comprising the polymer(s) and the protein farnesyl transferase inhibitor composition. Typically, the solution can be applied to the medical device by either spraying the solution onto the medical device or immersing the medical device in the solution. Whether one chooses application by immersion or application by spraying depends principally on the viscosity and surface tension of the solution, however, it has been found that spraying in a fine spray such as that available from an airbrush will provide a coating with the greatest uniformity and will provide the greatest control over the amount of coating material to be applied to the medical device. In either a coating applied by spraying or by immersion, multiple application steps are generally desirable to provide improved coating uniformity and improved control over the amount of protein farnesyl transferase inhibitor composition to be applied to the medical device. See, for example, European Patent No. 0623354 to Medtronic, Inc. The total thickness of the polymeric coating will range from about 0.1 micron to about 100 microns, preferably between about 1 micron and 20 microns. The coating may be applied in one coat or, preferably, in multiple coats, allowing each coat to substantially dry before applying the next coat. In one embodiment of the present invention the protein farnesyl transferase inhibitor composition is contained within a base coat, and a top coat containing only polymer is applied over the protein farnesyl transferase inhibitor-containing base coat to control release of the protein farnesyl transferase inhibitor into the tissue and to protect the base coat during handling and deployment of the stent. The coating may be of the entire medical device or to selected portions thereof, including grooves, holes, recesses, or other macroscopic features thereof that are amenable to drug deposition and coating, such as those disclosed in patents to Conormed, Inc., to de Scheerder and in U.S. Pat. No. 6,585,764 to Wright et al. The polymer chosen must be a polymer that is biocompatible and minimizes irritation to the vessel wall when the medical device is implanted. It must also exhibit high elasticity/ductility, resistance to erosion, elasticity, and controlled drug release. The polymer may be either a biostable or a bioabsorbable polymer depending on the desired rate of release or the desired degree of polymer stability. Bioabsorbable polymers that could be used include poly(L-lactic acid), polycaprolactone, poly(lactide-co-glycolide), poly(ethylene-vinyl acetate), poly(hydroxybutyrate-co-valerate), polydioxanone, polyorthoester, polyanhydride, poly(glycolic acid), poly(D,L-lactic acid), poly(glycolic acid-co-trimethylene carbonate), polyphosphoester, polyphosphoester urethane, poly(amino acids), cyanoacrylates, poly(trimethylene carbonate), poly(iminocarbonate), copoly(ether-esters) (e.g. PEO/PLA), polyalkylene oxalates, polyphosphazenes and biomolecules such as fibrin, fibrinogen, cellulose, starch, collagen and hyaluronic acid. Also, biostable polymers with a relatively low chronic tissue response such as polyurethanes, silicones, and polyesters could be used and other polymers could also be used if they can be dissolved and cured or polymerized on the medical device such as polyolefins, polyisobutylene and ethylene-alphaolefin copolymers; acrylic polymers and copolymers, ethylene-co-vinylacetate, polybutylmethacrylate, vinyl halide polymers and copolymers, such as polyvinyl chloride; polyvinyl ethers, such as polyvinyl methyl ether; polyvinylidene halides, such as polyvinylidene fluoride and polyvinylidene chloride; polyacrylonitrile, polyvinyl ketones; polyvinyl aromatics, such as polystyrene, polyvinyl esters, such as polyvinyl acetate; copolymers of vinyl monomers with each other and olefins, such as ethylene-methyl methacrylate copolymers, acrylonitrile-styrene copolymers, ABS resins, and ethylene-vinyl acetate copolymers; polyamides, such as Nylon 66 and polycaprolactam; alkyd resins; polycarbonates; polyoxymethylenes; polyimides; polyethers; epoxy resins, polyurethanes; rayon; rayon-triacetate; cellulose, cellulose acetate, cellulose butyrate; cellulose acetate butyrate; cellophane; cellulose nitrate; cellulose propionate; cellulose ethers; and carboxymethyl cellulose. The polymer-to-protein farnesyl transferase inhibitor composition ratio will depend on the efficacy of the polymer in securing the protein farnesyl transferase inhibitor composition onto the medical device and the rate at which the coating is to release the protein farnesyl transferase inhibitor composition to the tissue of the blood vessel. More polymer may be needed if it has relatively poor efficacy in retaining the protein farnesyl transferase inhibitor composition on the medical device and more polymer may be needed in order to provide an elution matrix that limits the elution of a very soluble protein farnesyl transferase inhibitor composition. A wide ratio of therapeutic substance-to-polymer could therefore be appropriate and could range from between about 10:1 to about 1:100, preferably between about 1:1 to about 1:10 (w/w). In one embodiment of the present invention a vascular stent as depicted in FIG. 1 is coated with protein farnesyl transferase inhibitors using a two-layer biologically stable polymeric matrix comprised of a base layer and an outer layer. Stent 10 has a generally cylindrical shape and an outer surface 12, an inner surface 14, a first open end 16, a second open end 18 and wherein the outer and inner surfaces 12, 14 are adapted to deliver an anti-restenotic effective amount of at least one protein farnesyl transferase inhibitor in accordance with the teachings of the present invention. Briefly, a polymer base layer comprising a solution of ethylene-co-vinylacetate and polybutylmethacrylate is applied to stent 10 such that the outer surface 12 is coated with polymer. In another embodiment both the inner surface 14 and outer surface 12 of stent 10 are provided with polymer base layers. The protein farnesyl transferase inhibitor or mixture thereof is incorporated into the base layer. Next, an outer layer comprising only polybutylmethacrylate is applied to stent 10 outer layer 14 that has been previous provide with a base layer. In another embodiment both the inner surface 14 and outer surface 12 of stent 10 are proved with polymer outer layers. The thickness of the polybutylmethacrylate outer layer determines the rate at which the protein farnesyl transferase inhibitors elute from the base coat by acting as a diffusion barrier. The ethylene-co-vinylacetate, polybutylmethacrylate and protein farnesyl transferase inhibitor solution may be incorporated into or onto a medical device in a number of ways. In one embodiment of the present invention the protein farnesyl transferase inhibitor/polymer solution is sprayed onto the stent 10 and then allowed to dry. In another embodiment, the solution may be electrically charged to one polarity and the stent 10 electrically changed to the opposite polarity. In this manner, the protein farnesyl transferase inhibitor/polymer solution and stent will be attracted to one another thus reducing waste and providing more control over the coating thickness. In another embodiment of the present invention the protein farnesyl transferase inhibitor is a protein farnesyl transferase and the polymer is bioresorbable. The bioresorbable polymer-protein farnesyl transferase blends of the present invention can be designed such that the polymer absorption rate controls drug release. In one embodiment of the present invention a polycaprolactone-tipifarnib (or lonafarnib) blend is prepared. A stent 10 is then stably coated with the polycaprolactone-tipifarnib (or lonafarnib) blend wherein the stent coating has a thickness of between about 0.1 micron and 100 microns, preferably between about 1 micron and 20 microns. The polymer coating thickness determines the total amount of tipifarnib or lonafarnib delivered and the polymer's absorption rate determines the administration rate. Using the preceding guidelines it is possible for one of ordinary skill in the part of polymer chemistry to design coatings having a wide range of dosages and administration rates. Furthermore, drug delivery rates and concentrations can also be controlled using non-polymer containing coatings and techniques known to persons skilled in the art of medicinal chemistry and medical device manufacturing. The following examples are provided to more precisely define and enable the protein farnesyl transferase inhibitor-eluting medical devices of the present invention. It is understood that there are numerous other embodiments and methods of using the present invention that will be apparent to those of ordinary skill in the art after having read and understood this specification and examples. These alternate embodiments are considered part of the present invention. The following Examples are intended to illustrate a non-limiting process for coating metallic stents with a protein farnesyl transferase inhibitor and testing their anti-restenotic properties. One non-limiting example of a metallic stent suitable for use in accordance with the teachings of the present invention is the Medtronic Vascular, Inc. Driver® cobalt alloy coronary stent. Medtronic Vascular, Inc. Driver® cobalt alloy coronary stents were placed in a glass beaker and covered with reagent grade or better hexane. The beaker containing the hexane-immersed stents was then placed into an ultrasonic water bath and treated for 15 minutes at a frequency of between approximately 25 to 50 KHz. Next the stents were removed from the hexane and the hexane was discarded. The stents were then immersed in reagent grade or better 2-propanol and vessel containing the stents and the 2-propanol was treated in an ultrasonic water bath as before. Following cleaning the stents with organic solvents, they were thoroughly washed with distilled water and thereafter immersed in 1.0 N sodium hydroxide solution and treated at in an ultrasonic water bath as before. Finally, the stents were removed from the sodium hydroxide, thoroughly rinsed in distilled water and then dried in a vacuum oven overnight at 40° C.
After cooling the dried stents to room temperature in a desiccated environment they were weighed their weights were recorded. In the following Example chloroform or tetrahydrofuran is chosen as the solvent of choice. Both the polymer and tipifarnib or lonafarnib are freely soluble in these solvents. Persons having ordinary skill in the art of polymer chemistry can easily pair the appropriate solvent system to the polymer-drug combination and achieve optimum results with no more than routine experimentation. 250 mg of tipifarnib or lonafarnib is carefully weighed and added to a small neck glass bottle containing 2.8 ml of chloroform or tetrahydrofuran and thoroughly mixed until a clear solution is achieved. Next 250 mg of polycaprolactone (PCL) is added to the tipifarnib or lonafarnib solution and mixed until the PCL dissolved forming a drug/polymer solution. The cleaned, dried stents are coated using either spraying techniques or dipped into the drug/polymer solution. The stents are coated as necessary to achieve a final coating (drug plus polymer) weight of between about 10 μg and 1.0 mg. Finally, the coated stents are dried in a vacuum oven at 50° C. overnight. The dried, coated stents are weighed and the weights recorded. The concentration of drug loaded onto the stents is determined based on the final coating weight. Final coating weight is calculated by subtracting the stent's pre-coating weight from the weight of the dried, coated stent. A cleaned, dry stent is first coated with polyvinyl pyrrolidone (PVP) or another suitable polymer followed by a coating of tipifarnib or lonafarnib. Finally, a second coating of PVP is provided to seal the stent thus creating a PVP-tipifarnib or lonafarnib-PVP sandwich coated stent. 100 mg of PVP is added to a 50 mL Erlenmeyer containing 12.5 ml of chloroform or tetrahydrofuran. The flask was carefully mixed until all of the PVP is dissolved. In a separate clean, dry Erlenmeyer flask 250 mg of tipifarnib or lonafarnib is added to 11 ml of the same solvent and mixed until dissolved. A clean, dried stent is then sprayed with PVP until a smooth confluent polymer layer was achieved. The stent was then dried in a vacuum oven at 50° C. for 30 minutes. Next, successive layers of tipifarnib or lonafarnib are applied to the polymer-coated stent. The stent is allowed to dry between each of the successive tipifarnib or lonafarnib coats. After the final tipifarnib or lonafarnib coating has dried, three successive coats of PVP are applied to the stent followed by drying the coated stent in a vacuum oven at 50° C. overnight. The dried, coated stent is weighed and its weight recorded. The concentration of drug in the drug/polymer solution and the final amount of drug loaded onto the stent determine the final coating weight. Final coating weight is calculated by subtracting the stent's pre-coating weight from the weight of the dried, coated stent. 1.00 g of tipifarnib or lonafarnib is carefully weighed and added to a small neck glass bottle containing 12 ml of chloroform or tetrahydrofuran, heated at 50° C. for 15 minutes and then mixed until the tipifarnib or lonafarnib is completely dissolved. Next a clean, dried stent is mounted over the balloon portion of angioplasty balloon catheter assembly. The stent is then sprayed with, or in an alternative embodiment, dipped into, the tipifarnib or lonafarnib solution. The coated stent is dried in a vacuum oven at 50° C. overnight. The dried, coated stent was weighed and its weight recorded. Six animals were used in each control group. The first control group tests the anti-restenotic effects of the clean, dried stent having neither polymer nor drug coatings. The second control group tests the anti-restenotic effects of polymer alone. Clean, dried stents having PCL coatings without drug are used in the second control group. Three different stent configurations and two different drug dosages are evaluated for their anti-restenotic effects. Twelve animals are included in each group. Group 1, designated the fast release group, uses stents coated with 50 μg tipifarnib or lonafarnib without polymer in accordance with the teachings of the present invention. Group 2, designated the slow-release group, uses stents coated with 50 μg of tipifarnib or lonafarnib impregnated within a polymer at a tipifarnib or lonafarnib to polymer ratio of 1:9 in accordance with the teachings of the present invention. Group 3, designated the medium-release group, uses stents coated with 250 μg of tipifarnib or lonafarnib impregnated within a polymer at a tipifarnib or lonafarnib to polymer ratio of 1:1 in accordance with the teachings of the present invention. The swine has emerged as the most appropriate model for the study of the endovascular devices. The anatomy and size of the coronary vessels are comparable to that of humans. Furthermore, the neointimal hyperplasia that occurs in response to vascular injury is similar to that seen clinically in humans. Results obtained in the swine animal model are considered predictive of clinical outcomes in humans. Consequently, regulatory agencies have deemed six-month data in the porcine sufficient to allow progression to human trials. Non-atherosclerotic acutely injured RCA, LAD, and/or LCX arteries of the Farm Swine (or miniswine) are utilized in this study. Placement of coated and control stents is random by animal and by artery. The animals are handled and maintained in accordance with the requirements of the Laboratory Animal Welfare Act (P.L.89-544) and its 1970 (P.L. 91-579), 1976 (P.L. 94-279), and 1985 (P.L. 99-198) amendments. Compliance is accomplished by conforming to the standards in the Guide for the Care and the Use of Laboratory Animals, ILAR, National Academy Press, revised 1996. A veterinarian performs a physical examination on each animal during the pre-test period to ensure that only healthy pigs are used in this study. The animals are monitored and observed 3 to 5 days prior to experimental use. The animals have their weight estimated at least 3 days prior to the procedure in order to provide appropriate drug dose adjustments for body weight. At least one day before stent placement, 650 mg of aspirin is administered. Animals are fasted twelve hours prior to the procedure. Anesthesia is induced in the animal using intramuscular Telazol and Xylazine. Atropine is administered (20 μg/kg I.M.) to control respiratory and salivary secretions. Upon induction of light anesthesia, the subject animal is intubated. Isoflurane (0.1 to 5.0% to effect by inhalation) in oxygen is administered to maintain a surgical plane of anesthesia. Continuous electrocardiographic monitoring is performed. An I.V. catheter is placed in the ear vein in case it is necessary to replace lost blood volume. The level of anesthesia is monitored continuously by ECG and the animal's response to stimuli. Following induction of anesthesia, the surgical access site is shaved and scrubbed with chlorohexidine soap. An incision is made in the region of the right or left femoral (or carotid) artery and betadine solution is applied to the surgical site. An arterial sheath is introduced via an arterial stick or cutdown and the sheath is advanced into the artery. A guiding-catheter is placed into the sheath and advanced via a 0.035″ guide wire as needed under fluoroscopic guidance into the ostium of the coronary arteries. An arterial blood sample is obtained for baseline blood gas, ACT and HCT. Heparin (200 units/kg) is administered as needed to achieve and maintain ACT≧300 seconds. Arterial blood pressure, heart rate, and ECG are recorded. After placement of the guide catheter into the ostium of the appropriate coronary artery, angiographic images of the vessels are obtained in at least two orthagonal views to identify the proper location for the deployment site. Quantitative coronary angiography (QCA) is performed and recorded. Nitroglycerin (200 μI.C.) is administered prior to treatment and as needed to control arterial vasospasm. The delivery system is prepped by aspirating the balloon with negative pressure for five seconds and by flushing the guidewire lumen with heparinized saline solution. Deployment, patency and positioning of stent are assessed by angiography and a TIMI score is recorded. Results are recorded on video and cine. Final lumen dimensions are measured with QCA and/or IVUS. These procedures are repeated until a device is implanted in each of the three major coronary arteries of the pig. After final implant, the animal is allowed to recover from anesthesia. Aspirin is administered at 325 mg p.o. qd until sacrifice. After 28 days, the animals are anesthetized and a 6 F arterial sheath is introduced and advanced. A 6 F large lumen guiding-catheter (diagnostic guide) is placed into the sheath and advanced over a guide wire under fluoroscopic guidance into the coronary arteries. After placement of the guide catheter into the appropriate coronary ostium, angiographic images of the vessel are taken to evaluate the stented sites. At the end of the re-look procedure, the animal is euthanized with an overdose of Pentabarbitol I.V. and KCL I.V. The heart, kidneys, and liver are harvested and visually examined for any external or internal trauma. The organs are flushed with 1000 ml of lactated ringers at 100 mmHg and then flushed with 1000 ml of formalin at 100-120 mmHg. All organs are stored in labeled containers of formalin solution. The stented vessels are X-rayed prior to histology processing. The stented segments are processed for routine histology, sectioned, and stained following standard histology lab protocols. Appropriate stains are applied in alternate fashion on serial sections through the length of the treated vessels. A given treatment arm will be deemed beneficial if treatment results in a significant reduction in neointimal area and/or in-stent restenosis compared to both the bone stent control and the polymer-on control. 1. Human coronary smooth muscles cells (HCASMC) are obtained from Clonetics, a division of Cambrex, Inc.
2. HCASMC basal media is supplied by Clonetics and is supplemented with fetal bovine serum, insulin, hFGF-B (human fibroblast growth factor) hEGF (human epidermal growth factor). B. Human coronary artery smooth muscle cells proliferation inhibition studies. Human coronary smooth muscles cells (HCASMC) are seeded in 96-well polystyrene tissue culture plates at a density of 2.5×103 cells per well in a fully supplemented cell culture media and allowed to grow for three days. Cells are subsequently growth-arrested in basal medium for three days. The synchronized cells are then presented with 10% FBS to induce proliferation and various concentrations of farnesyl transferase inhibitors, tipifarnib or lonafarnib, are added and then incubated for 72 h. The plates are then blotted and frozen at −80° C.
At the time of assay, a lysis buffer is used to expose double stranded DNA (dsDNA). A fluorescently-labeled dye is used to detect total amount of dsDNA in each well. Fluorescence is read using a plate reader. The amount of fluorescence is directly proportional to dsDNA present in the plate and thus indicates the proliferation inhibition by tipifarnib or lonafarnib compared with untreated (DMSO vehicle only) coronary smooth muscles cells. A calibration curve is used to determine linear range of the assay. The calibration curve is used to express number of cells instead of total fluorescence. Data is graphed and analyzed with GraphPad Prism software to determine potency and efficacy of tipifarnib or lonafarnib. Tipifarnib or lonafarnib cytotoxicity against HCASMCs is evaluated by seeding 96-well cell culture plates with 8.0×103 HCASM cells/well in fully supplemented growth medium. After 24 h attachment, cells are presented with fully supplemented growth media containing from 0.1 nM to 10 uM of tipifarnib or lonafarnib. After 72 h of incubation, ToxiLight kit reagents are added to each well, and luminescence is read using a plate reader. The amount of luminescence is directly proportional to the amount of adenylate kinase (AK) present in the plate. Elevated levels of AK indicate cytotoxicity. 1. Human coronary artery endothelial cells (HCAEC) are obtained from Clonetics, a division of Cambrex, Inc.
B. Human Coronary Artery Endothelial Cell Growth. Human coronary artery endothelial cells (HCAEC) are seeded in 96-well tissue culture plates at a density of 800 cells per well in a fully supplemented cell culture media and allowed to grow for three days. Farnesyl transferase inhibitors, tipifarnib or lonafarnib, are added to the cells and incubated for 48 h. The plates are then blotted and frozen at −80° C.
At the time of assay, a lysis buffer is used to expose double stranded DNA (dsDNA). A fluorescently-labeled dye is used to detect total amount of dsDNA in each well. Fluorescence is read using a plate reader. The amount of fluorescence is directly proportional to dsDNA present in the plate and thus indicates the effect of tipifarnib or lonafarnib on the growth of coronary artery endothelial cells. The effect of tipifarnib or lonafarnib on endothelial re-growth is evaluated in a qualitative manner. HCAEC are seeded in clear 24-well plates (20,000 cells/well) and grown for 72 hours. After this incubation period, a sterile pipette tip is used to create a straight injury (groove) in the near confluent HCAEC monolayer. The growth medium is then aspirated (along with cells that detached during scraping) and replaced with fresh growth medium containing 10−7M drug tipifarnib or lonafarnib. Digital pictures (4× objective) of the freshly wounded layer are taken to serve as a baseline for injury assessment. After 48 h of incubation with tipifarnib or lonafarnib, a representative picture of each well in the injury area is captured. The extent of wound coverage is compared between groups. Unless otherwise indicated, all numbers expressing quantities of ingredients, properties such as molecular weight, reaction conditions, and so forth used in the specification and claims are to be understood as being modified in all instances by the terms “about” or “approximately.” Accordingly, unless indicated to the contrary, the numerical parameters set forth in the specification and attached claims are approximations that may vary depending upon the desired properties sought to be obtained by the present invention. At the very least, and not as an attempt to limit the application of the doctrine of equivalents to the scope of the claims, each numerical parameter should at least be construed in light of the number of reported significant digits and by applying ordinary rounding techniques. Notwithstanding that the numerical ranges and parameters setting forth the broad scope of the invention are approximations, the numerical values set forth in the specific examples are reported as precisely as possible. Any numerical value, however, inherently contain certain errors necessarily resulting from the standard deviation found in their respective testing measurements. The terms “a” and “an” and “the” and similar terms used in the context of describing the invention (especially in the context of the following claims) are to be construed to cover both the singular and the plural, unless otherwise indicated herein or clearly contradicted by context. Recitation of ranges of values herein are merely intended to serve as a shorthand method of referring individually to each separate value falling within the range. Unless otherwise indicated herein, each individual value is incorporated into the specification as if it were individually recited herein. All methods described herein can be performed in any suitable order unless otherwise indicated herein or otherwise clearly contradicted by context. The use of any and all examples, or exemplary language (e.g. “such as”) provided herein is intended merely to better illuminate the invention and does not pose a limitation on the scope of the invention otherwise claimed. No language in the specification should be construed as indicating any non-claimed element essential to the practice of the invention. Furthermore, numerous references have been made to patents and printed publications throughout this specification. Each of the above cited patents and printed publications are herein individually incorporated by reference. 1. An implantable medical device for the treatment or inhibition of restenosis coated with a protein farnesyl transferase inhibitor selected from the group consisting of tipifarnib, lonafarnib, and pharmaceutically acceptable derivatives thereof. 2. The medical device according to claim 1 selected from the group consisting of stents, catheters, micro-particles, probes and vascular grafts. 3. The medical device according to claim 2 wherein said stent is an intravascular stent, esophageal stent, urethral stent or biliary stent. 4. The medical device according to claim 3 coated with a biocompatible polymer. 5. An intravascular stent for site-specific, controlled-release delivery of a medicament for Ithe treatment or inhibition of restenosis, said stent having a coating comprising a biocompatible polymer and a protein farnesyl transferase inhibitor selected from the group consisting of tipifarnib, lonafarnib and pharmaceutically acceptable derivatives thereof. 6. The intravascular stent according to claim 5 wherein the protein farnesyl transferase inhibitor is tipifarnib or a pharmaceutically acceptable salt thereof. 7. The intravascular stent according to claim 5 wherein the protein farnesyl transferase inhibitor is lonafarnib or a pharmaceutically acceptable salt thereof. wherein said protein farnesyl transferase inhibitor and said biocompatible polymer are in a ratio relative to each other of between about 1:1 to about 1:10 (w/w). 9. The intravascular stent according to claim 5 wherein said stent has a metallic body. 10. The intravascular stent according to claim 5 wherein said coating comprises at least one additional therapeutic agent. implanting said intravascular stent into a blood vessel lumen at risk for restenosis wherein said protein farnesyl transferase inhibitor is released into tissue adjacent said blood vessel lumen in a controlled release manner. coating said medical device with said tipifarnib or lonafarnib or pharmaceutically acceptable derivative thereof compounded with said carrier compound. 14. The method according to claim 13 wherein said medical device is an intravascular stent. 15. The method according to claim 13 wherein said carrier compound is a biocompatible polymer. 16. The method according to claim 13 wherein said coating is performed in multiple steps.